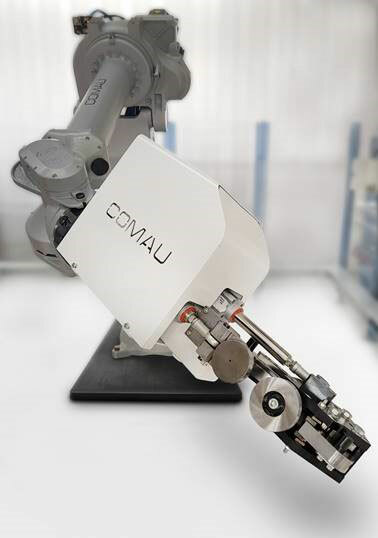 Italian industrial-automation provider Comau has introduced a new robotic roller-hemming process, targeting lightweight- and electric-vehicle manufacturing. The Smart Hemmer, a compact, symmetrical roller hemmer that reportedly can hem any complex joint, is ideal for the new generation of these vehicles, according to company officials, as it allows automakers to join dissimilar materials using a cold process that grants complete control throughout the process. The Smart Hemmer design features two flexible rollers in which the linear roller can automatically disengage when encountering obstacles or a curved path, and avoids the inflexible fixed anvil employed in traditional roller-hemming processes. As a result, it performs curved-path hemming and manages complex angles as part of a single, continuous process, and maintains a constant hemming thickness even when encountering multiple layers of dissimilar materials. The Industry 4.0-compliant hemming head, jointly developed by Comau and an automotive manufacturer, reportedly offers high reliability, inherent flexibility and complete process control while ensuring geometric uniformity of assembled parts. Field-tested and validated by major European automakers, Smart Hemmer, a standardized product, can be applied to all vehicle architectures and complements the array of similar cold-joining technologies developed by Comau.